Registering your profile on one any of the best matrimonial site is not always enough to get the positive responses on your matrimonial profile. Although, your matrimonial profile must be attractive and stunning than others to get more responses from the other prospects. But, you also needs to consider other useful and important information also. Never avoid to fill all the important information, it will help others to understand your matrimonial profile more easily. You must write correct and attractive matrimonial profile description, which is very much compulsory to get maximum responses from other prospects. You can have a look at the matrimony profile samples along with the descriptions and after that, you can write your matrimonial profile description accordingly. If you need some more matrimonial profile samples, you can ask in chat below on the bottom right side of this page. Matrimonial sites have a online registration process, in which about yourself section is present. People search this term on google "about me in matrimony" and "about me for matrimony". 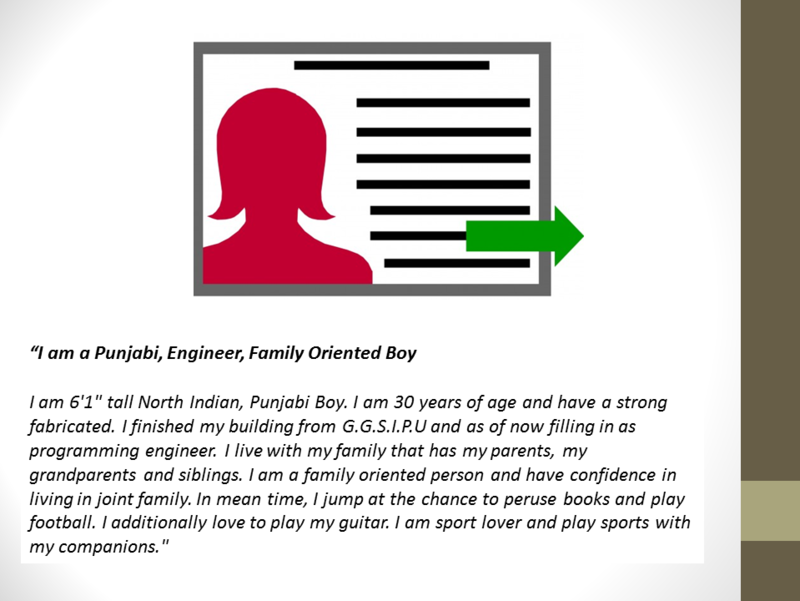 When it comes to create a awesome matrimonial profile, first step is to create bio data for marriage. If the children are of marriageable age, how will you get to know, by the parents from the stress on their face because, in India, marriage is an important issue, yes it is an issue if you are of marriageable age and your parents are working hard?. So in this stress and to low it, they end up registering their child’s profile on the matrimonial site. The registration process is simple and free after the registration but one challenge come and that challenge is writing the best matrimony profile description. A profile description tells about you as a person like about your family background, education, professional career, hobbies or interest but what if the description you have given does not work out. What kind of profile description or about me would be great enough to give you the maximum response? So in here, we are with 5 matrimonial profile descriptions("About me in matrimony for bride", "About me in matrimony for groom"). "I am a 26 year old 5’5’’ tall, slim woman, based in Delhi. I have MBBS degree from AIMS and an MS from New York. I am currently practicing as a cardiologist in a well-reputed hospital of Delhi. I intend to pursue my career after marriage and looking for someone who will appreciate living with a progressive, independent woman. I love reading books and co0llecting the antiques." "I have a master degree in fine arts from Delhi University and preparing for Net, want to pursue PhD. further. I am trained in classical music and use to teach it also but in part time without any fees. With music I love painting; several of paintings have been selected at the international level for the exhibition. I love spending time with my family and like to cook new cuisines for them." "I am IT professional based in Mumbai, working in as a senior software engineer. My husband expired in a plane crash two years ago, that point broke me fully but my daughter gave me the reason to be strong. My 4 years daughter keeps me busy with her but when I get time I use to pursue my hobby of cooking. I have supportive parents, I believe in accepting the variables and live with them happily." "I am 6'1" tall North Indian, Punjabi Boy. I am 30 years of age and have a strong fabricated. I finished my building from G.G.S.I.P.U and as of now filling in as programming engineer. I live with my family that has my parents, my grandparents and siblings. I am a family oriented person and have confidence in living in joint family. In mean time, I jump at the chance to peruse books and play football. I additionally love to play my guitar. I am sport lover and play sports with my companions." "I am 32 years of age Boy who belongs to a business family. I am 6'1" in height and good built. I am a gym freak. I have enthusiasm for wellness and believe in healthy life. I have my own transportation business. I live with my mom, father and younger brother. My hobbies are adventurous sports and hiking. I really love travelling. I have strong faith in present day living yet in addition pursue my social morals. Aside from this, I like to cook, and it is one of my side interests. I invest my free energy with companions. Every one of them thinks about me as fun and cheerful individual." "I am a very open-minded, cool, calm and caring person. I did master's in MBA from ABCD university, one of the premier B-schools in India. I am currently working as project manager in ABCD corporate IT in Banglore. Als, i did my B.Tech fom ABCD College. I love travelling - make outings with friends very often. I am a movie bluff - watch movies regularly. I play badminton regularly as well. I am a fitness concious guy." "I am a tall, handsome, and decent looking 32-year-old person, trying my luck to find the true partner again. I married five years ago but due to different lifestyles and way of living life things didn’t work out so with mutual consent we took divorce. 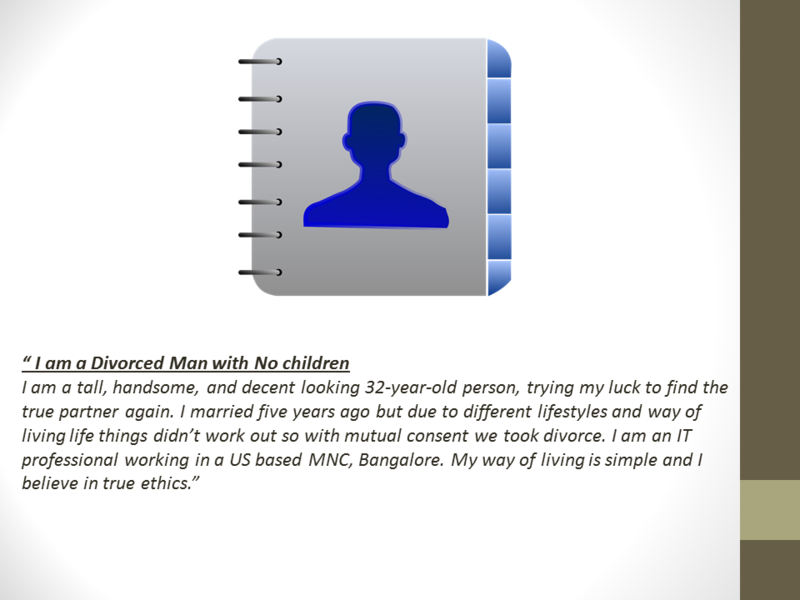 I am an IT professional working in a US based MNC, Bangalore. My way of living is simple and I believe in true ethics." "I am a 31 years old fair looking person working in an MNC, Gurgaon. I have a degree in engineering from NIT. I lost my legs about 6 years ago in a disastrous car accident, from it I survived physically but mentally I had to face lots of problems, but after continuous effort and support from my family I regained myself and started working the way I used to do. I am financially independent and strong person and pursue my hobby of photography side by side. I enjoy life it is the greatest extent."